6.2-litre V8 engine, the Jeep Grand Cherokee, the most awarded SUV ever and the most capable full-size SUV on the planet, has been transformed into the most powerful and quickest SUV ever. Introducing the new Jeep Grand Cherokee Trackhawk and its set to arrive in New Zealand in 2018. The new benchmark 527kW supercharged engine combines with an upgraded high-torque-capacity TorqueFlite eight-speed automatic transmission, world-class on-road driving dynamics and new Brembo brakes to deliver a new level of performance: 0-100km/h in 3.6 seconds, a standing quarter mile in 11.6 seconds (at 186km/h), top speed of 290km/h, 100km/h-0 braking distance in 36m and .88g capability on the skid pad. Built in Detroit at the Jefferson North Assembly Plant, the new Grand Cherokee Trackhawk will arrive in USA showrooms in the fourth quarter of 2017, followed by a 2018 New Zealand launch when prices and specifications will be announced. Powering the new Jeep Grand Cherokee Trackhawk is a supercharged 6.2-litre V8 engine delivering an astonishing 527kW and 874Nm. The breakthrough supercharged engine is designed and manufactured using only the strongest and most durable materials. Its cast iron block features water jackets between the cylinders for optimal cooling. A forged-steel crankshaft with induction-hardened bearing surfaces is so strong it can withstand firing pressures of nearly 1,600psi (110bar) – the equivalent of five family sedans standing on each piston, every two revolutions. The unique, specially tuned crankshaft damper has been burst tested to 13,000rpm. Premium grade, heat-treated aluminium-alloy cylinder heads are optimised for superior thermal conductivity. Sodium-cooled exhaust valves feature hollow-stem construction and special steel-alloy heads that stand up to temperatures as high as 900 degrees Celsius. The supercharger is sealed for life with premium synthetic oil, uses a drive ratio of 2.36:1 and has a maximum speed of 14,600rpm. The supercharger drive system’s one-way clutch de-coupler improves refinement, while allowing for precisely the kind of powerful sound certain to captivate Jeep Grand Cherokee Trackhawk drivers. A new low-temperature cooling system, consisting of a pump, reservoir, heat exchanger and lines, help keep the charge air cool during performance driving. This system is designed to keep intake air temperatures below 60 degrees Celsius, under extreme ambient conditions, while enabling air flow of up to 500 litres/second. The performance of the new Jeep Grand Cherokee Trackhawk is bolstered by various upgraded driveline components engineered to handle the extreme torque output from the supercharged engine. 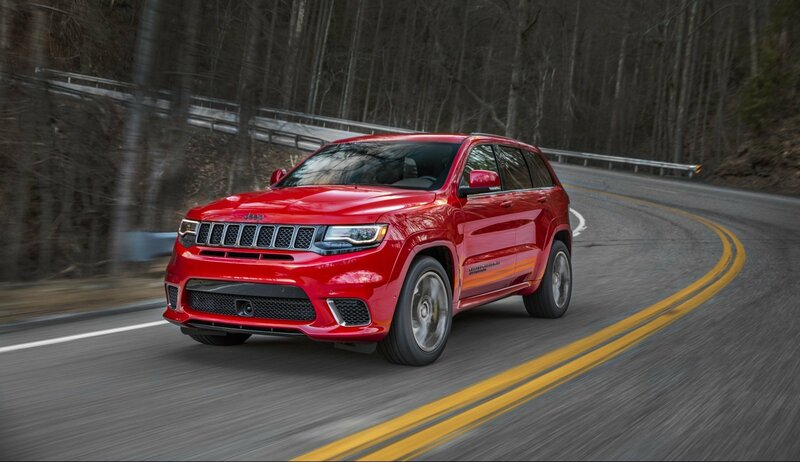 The new Grand Cherokee Trackhawk is equipped with the Jeep Quadra-Trac on-demand four-wheel-drive system, which includes an electronic limited-slip rear differential and a single-speed active transfer case. The new, full-time active transfer case uses forged steel chain sprockets and a wider chain for added strength and durability. A strengthened rear driveshaft connects to a new, stronger rear axle. The differential features a revised housing design, revised ring-and-pinion tooth geometry and new four-point axle mounting scheme for better load distribution, additional torque capacity and overall durability. Torque is delivered to the rear wheels via new ultra-high-strength low-alloy vacuum melted steel half-shafts with upgraded eight-ball outboard constant velocity joints. Standard Launch Control optimises the Grand Cherokee Trackhawk’s performance by coordinating the engine, transmission, driveline and suspension for a textbook launch and consistent straight-line acceleration. A new standard Torque Reserve system provides improved engine torque response and quicker vehicle acceleration in Launch Control by pre-positioning the supercharger bypass valve to generate boost and minimise manifold filling time, while cutting fuelling to individual cylinders and managing spark timing. This generates a reserve of torque that can be instantaneously delivered upon acceleration from a standing stop. The Selec-Track system on the Grand Cherokee Trackhawk uses performance-tuned software to pre-configure and distinguish the five dynamic modes: Auto, Sport, Track, Snow and Tow, enabling drivers to choose a vehicle setting that ideally meets their requirements and ambient conditions. The drive modes separately control the four-wheel-drive system, transmission, paddle shifters, suspension and electric power steering. The new Grand Cherokee Trackhawk also features a Custom Mode that allows the driver to personalise the vehicle’s performance with a selectable driving experience offering a multitude of vehicle system combinations. The Jeep Grand Cherokee Trackhawk rides on a short- and long-arm (SLA) independent front suspension with coil springs, Bilstein adaptive damping suspension (ADS), upper- and aluminium lower-control arms (“A” arms), aluminium knuckle, aluminium clevis and hollow stabiliser bar. The rear suspension is a multi-link design with coil spring, Bilstein ADS, aluminium lower control arm, independent upper links (tension and camber), plus a separate toe link, and a hollow stabiliser bar. The North American Jeep Grand Cherokee Trackhawk is capable of towing 3272kg. New high-performance Brembo brakes include the largest standard front brakes ever offered on a Jeep vehicle. Up front are 400mm two-piece vented rotors with six-piston callipers painted with a new distinctive yellow finish, and 350mm vented rotors with four-piston yellow callipers in the rear for outstanding stopping performance, heat management and durability. The new Brembo brakes bring the new Grand Cherokee Trackhawk to a stop from 100km/h in 36m. For added safety, the anti-lock braking, electronic stability control and traction systems are uniquely tuned. The new Jeep Grand Cherokee Trackhawk rides 25mm lower than non-SRT Grand Cherokee models and is further set apart with body-coloured wheel flares, side sill cladding and a sculpted bonnet with dual heat extractors. The signature seven-slot upper front grille is flanked by adaptive, bi-xenon headlamps and surrounded by an LED character headlamp treatment. The headlamps on the Trackhawk feature a unique Gloss Black background to accent their jewel-like appearance. The foglights are absent from the Trackhawk’s front fascia to optimise airflow to cooling modules and air induction without compromising the vehicle’s balance. From behind, the new Grand Cherokee Trackhawk features a unique Gloss Black rear valance that showcases four-inch Black Chrome quad exhaust tips. The new quad exhaust system design provides an exhilarating and unmistakable note during maximum acceleration. New standard 20×10-inch Titanium colour wheels with a Satin Chrome centre cap showcase the distinctive yellow callipers underneath. Available lightweight 20×10-inch forged aluminium Low Gloss Black wheels save 5.5kg versus the standard Trackhawk wheel. The new Grand Cherokee Trackhawk also features all-new Pirelli 295/45ZR20 Scorpion Verde All-Season and new Pirelli P Zero three-season tires with an increased speed rating. The new Jeep Grand Cherokee Trackhawk is available in nine exterior colours: Billet Silver, Granite Crystal, Diamond Black, Ivory Tri-coat, Bright White, Velvet Red, Rhino, Redline and True Blue. The driver-focused interior features premium soft-touch materials, unique Light Black Chrome finishes and carbonfibre spears and a 7-inch driver information display (DID) instrument cluster with the tachometer in the middle. The 320km/h speedometer is on the left side of the cluster. The instrument panel centre stack with new 8.4-inch Uconnect touchscreen features Performance Pages that showcase an array of performance timers and gauge readouts, including a new engine dynamometer screen that measures instantaneous horsepower, torque and current transmission gear. The dynamometer screen also includes a new snapshot function for owners to save their readouts on a USB. The new Jeep Grand Cherokee Trackhawk’s three-spoke, flat-bottom steering wheel features a bevy of comfort, convenience and connectivity controls and ergonomically efficient paddle shifters. The Trackhawk features standard Nappa leather and suede seats with an embroidered “Trackhawk” logo. A fully wrapped Signature Leather Interior Package with “Trackhawk” embossed on the seats, optional in black, or black and Dark Ruby Red is available. Seats are also heated (front and rear) and ventilated (front). Dark Ruby Red seatbelts and a dual-pane panoramic sunroof are also available options. Drivers can activate and deactivate Valet mode with a personalised four-digit PIN code. Other prominent available Grand Cherokee Trackhawk safety and security features include Adaptive Cruise Control with Stop; Advanced Brake Assist; Blind-spot Monitoring with Rear Cross Path Detection; Full-speed Forward Collision Warning with Crash Mitigation; Front and Rear Park Assist; Lane Departure Warning-Plus; and Ready Alert Braking. Seamlessly integrates an iPhone with the vehicle’s built-in display and controls in addition to featuring Siri Voice control. iPhone-equipped drivers can make phone calls, access music, send and receive messages, and receive voice-guided navigation optimised for traffic conditions and more, while staying focused on the road. The latest Uconnect operating system includes easy-to-use features, pinch-to-zoom display, enhanced processing power, faster startup times and touchscreens that display high-resolution graphics. The Jeep vehicle line-up in the USA consists of the Cherokee, , Grand Cherokee, Renegade and Wrangler. To meet consumer demand around the world, all Jeep models sold outside North America are available in both left and right-hand drive configurations and with gasoline and diesel powertrain options.